You've heard the term bias cut gown but what exactly does it mean? 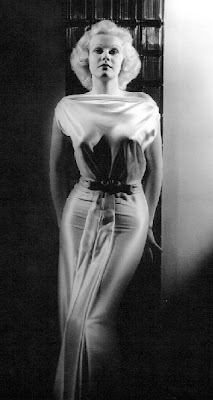 Before the development of knits, the bias cut was used for body-hugging silhouettes like the Edith Head dress above and below. It all started in 1927 when a Parisian couturier, Madeleine Vionette developed a technique using the true cross grain of fabric. Defined, a bias cut simply means the pattern pieces are placed on the cross grain rather than straight grain lines of weft or warp of the fabric. By 1930, Hollywood designers took advantage of this cut and made it into a real trend. So what are the advantages of a bias cut gown? Fit. Gowns cut on the true bias hug and cling to the hips and midriff and fall beautifully. Many times they seem like a second skin. 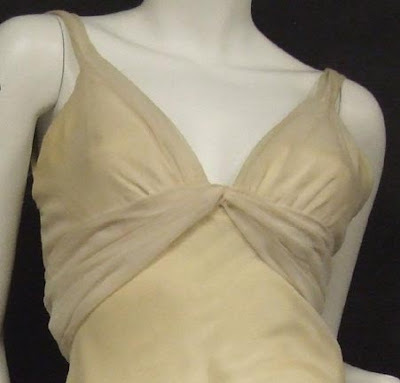 Hollywood designer dressed actress Jean Harlow in these bias cuts that practically became her trademark. The bias cut is still used today despite the fact we have a variety of knits and micro fibers that can mimic the same close fit. 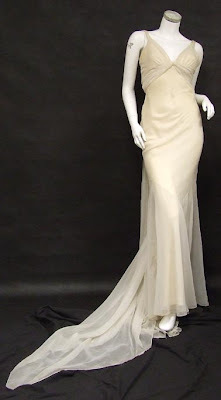 Wonderful pictures, particularly your use of the Jean Harlow picture to illustrate the Bias Cut Gown feature. Hi! I'm an aspiring model and just wanted to tell you how helpful and great this article was. When I thought to look this up, I though, "Great, this'll take FOREVER!!". But it didn' take long at all, and I didn't get bored! Go You!!! 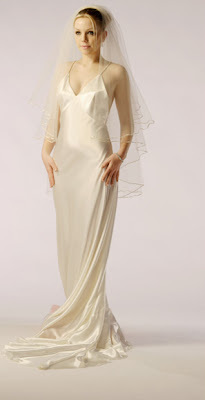 Lovely wedding gowns and fabrics. Can we have some another party gowns ideas. I really like it. Thanks for posting and keep posting more.